Here in Mexico City, the news arrived first thing this morning. It was a complete shock - I had no idea he'd been battling cancer for 18 months - and yet, it wasn't. Something had prepared me for it. Even his death was a piece of performance, a piece of art. I spent today in a bit of a daze, stopping in a cafe on my way to work to read all the reaction and twitter tributes and then, in-between (actually during) meetings thinking about what Bowie meant to me. I grew up with him. 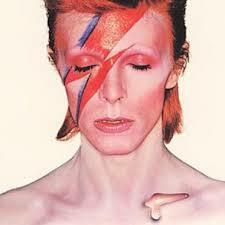 One of the first albums I ever bought was Pin-Ups in 1973, closely followed by Ziggy Stardust and Aladdin Sane. Everything about him was so alluring: music, looks, lyrics, the whole thing. I saw him live four times, including the Stage tour in 1978 at Earls Court. I can still remember first listening to side two of Low the year before (for some reason I played it before side one). Would a pop star ever do such a thing now? Inconceivable. In the 70s he was untouchable. And with Scary Monsters he began the 80s in equally impressive fashion. Thereafter he rather lost his muse, but every now and again he'd pop up and surprise. 'This Is Not America' with Pat Metheney, was beautiful. Reunited with Eno, Outside (1994) was complex and daring. Some of his drum and bass stuff on Earthling was actually pretty good. And I was lucky enough to see one of his last ever concerts at the Budokan in Tokyo in 2003, which was fantastic. This evening I got all my Bowie LPs and CDs out - 31 in total - and played a random selection. 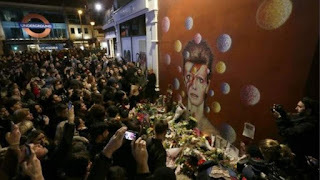 At the same time Sam sent me messages from Brixton where, impromptu, huge crowds gathered by a Ziggy mural on the High Street and outside the Ritzy Cinema. Being a one-time Brixtonian, I feel I should be there (although in truth he's usually more associated with Beckenham where he moved to aged six). So, the end of an era and very very sad. The one thing that cheered me up was this tweet: If you're sad today, just remember the world is over 4 billion years old and you somehow managed to exist at the same time as Bowie."